Here is a Chinese Elm that I bought from a local bonsai nursery. 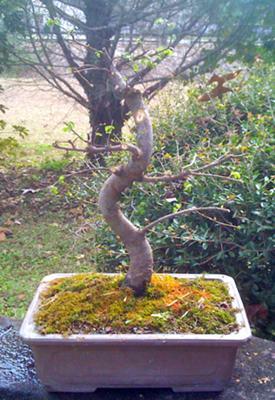 It is just starting to bud, so it was time to root prune and pot the tree. I also pruned the tree to ONLY keep the branches that I know I will keep. I love the s shaped curve of the trunk! I'm not really sure what I will do with the top of the tree. I may try to develop the existing branches to build an apex. I might cut the tree down a bit and build the apex from scratch. This is in an 8 inch unglazed chinese pot. Unfortunately, the moss is covering a nice root flare on the left side of the tree. The moss is there to help the tree retain moisture as it grows into this new pot.